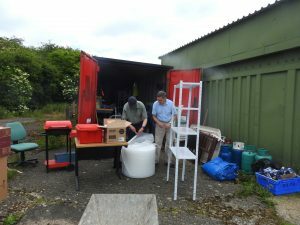 You will have realised by now that we are moving the YAS Observatory to Beetle Bank Farm (more info below and this is taking up much of the committee and trustee’s time. We have also organised our first event at the new location on 27th July. The YAS Annual BBQ is ON – more details below on all these. Priory Street meeting. Mike Terzza of our society gave a well illustrated talk entitled “A Journey into Astrophotography”. In his talk, Mike described how he started and developed this very rewarding activity and advised us how, with a bit of dedication and a willingness to experiment, we can start down the same road. The planned working party to decommission the Observatory took place. 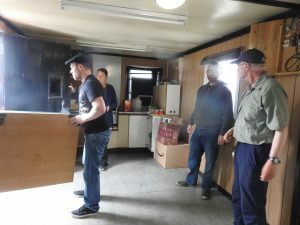 The warm room was emptied (except for the battery storage and the kitchen fitments). Priory Street “Informal Night” meeting. Martin Whipp gave a lively report on his recent visit to Hamburg with an ultimate astronomy related twist. One of the highlights on the way was a visit to Miniatur Wunderland the world’s largest model railway. Martin enthused over the attention to detail and showed a series of photos to illustrate this along with a video of model planes taking off. Martin then progressed to the main purpose of his visit which was to take a short trip on the Cunard Cruise ship RMS Queen Mary 2. This is the only cruise ship with a planetarium on board. Martin was able to get a behind the scenes tour. We were treated to an explanation of how a full size dome is able to rise up above an auditorium and only take up half the expected height! Graham ‘Bodger’ Moore presented a number of tips and tricks to utilise household items and various spare parts; for example to make a table attachment for a scope tripod, suggestions as to how to prevent having to contort in order to polar align and other tips, too many to mention. Gerry Fisher presented his views on the risks of using leisure batteries to power your scope, without using sensible and cost effective solutions. Gerry warned of the dangers from an accidental short across exposed terminals that could cause significant injury or even cause the battery to explode showering you or others in battery acid.Gerry has offered to help any member to make a safe, fused connection system to use with their battery. If you want to make your own power supply please speak to Gerry. As we do more outreach, safety will become more important. 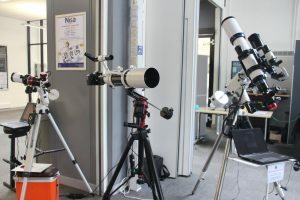 We were invited to have a presence at the recent Astronomy Day at York University as part of the York Festival of Ideas. Committee / Trustee meeting took place on Friday 29th June. Here are some selected highlights. Not surprisingly, the main topic of discussion was the rapidly approaching move to Beetle Bank Farm. Derek Farmer reported on the planning application made to York City Council on 13th June. At the time of writing, the application had not been published on the YCC website. However, we are told the 8 week target for a decision would still count from application date. When the application is published for comment we will let you all know and would encourage you to comment positively on the application. We should know the outcome by mid August. Based on this, the likelihood is that we will be moving the containers on either the first or second Tuesday in September. This target date has been communicated to the YGC. The move date has to be a Tuesday as Beetle Bank is normally closed on Tuesday. When planning approval is received, in mid August, the foundations for the containers and the concrete pads for the scopes will need to be dug and a few tons of concrete poured. At the same time, an electrical supply will probably be prepared. We will be calling for volunteers to help with this nearer the time. If you are willing to help with this and potentially other observatory works please let us know at info@yorkastro.org.uk . Discussion took place regarding the draft lease and the negotiators Gerry Fisher, Mike Terzza and Derek Farmer were given some parameters within which to negotiate. Forthcoming events and level of commitment from members during the year were discussed. The current York Astro photo challenge “The Summer Triangle” set by Freda Rockliffe is still open. Submit your entry via YAS Facebook chat group or by email to info@yorkastro.org.uk by noon on July 6th. Priory Street meeting. Dr Emily Brunsden of York University will give a talk entitled “Fantastic Planets and how to find them”. Dr Brunsden is the Director of Astrocampus and is an accomplished and experienced lecturer. This talk should not be missed. Special event and observation session at Beetle Bank Farm to learn about and hopefully experience the total lunar eclipse visible that evening. See detailed eclipse timings below. A number of members have already volunteered to assist here and help raise funds for YAS. At this event, we hope to include a live video feed and commentary from the desert east of Dubai where the deepest phase of the eclipse will be seen against an ink-black sky. We are also hoping to relay NASA images of the Earth looking back at it from an orbiting lunar satellite, showing the ring of fire round the Earth as light from the sun filters through Earth’s atmosphere and the Moon experiences an eclipse of the sun. There are, of course, a number of technical difficulties to overcome! The YAS Annual Perseid BBQ will take place at Beetle Bank Farm from 17:30 . As usual, we shall provide the heat, you provide the meat (or vegetarian). Also bring whatever ypu want to eat and drink with the meat. Again, as usual, bring your chairs to view the Perseids and scopes etc. Free to members and their families. Beetle Bank Farm are holding a camping weekend with a band, BBQ etc. 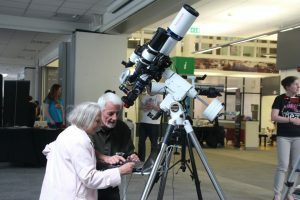 A number of members have volunteered to help at this by bringing a few scopes. Actual night to be decided nearer the dates. A few interesting things are happening in July. None of them is outstanding but they are all worth a look, especially the eclipse. Firstly, Saturn. Whilst all eyes have been on Jupiter during June, the opposition of Saturn on June 27th has passed unnoticed. If you don’t mind staying up late to see Saturn as it transits (crosses the meridian and is therefore highest in the sky), July is when it’s at its nearest. It transits at just before 1 a.m. on the 1st, 2350 on the 15th, and 2240 on the 31st. Unfortunately, the planet is in Sagittarius and only rises to an altitude of 13.5°. However, Saturn’s northern hemisphere is tilted towards us and the rings are just about as wide as they can be so it’s still worth having a look at what must be the most beautiful planet in the solar system. Next, Mars. This planet comes to opposition on the 27th. Mars’ orbit is more elliptical than most planets, so its distance from us varies quite a lot from opposition to opposition. This year, it comes just about closer than it can ever get, and at a distance of 35.8 million miles can be seen as a 24.3 arc second diameter disc. This is more than half the angular diameter of Jupiter, and we know how big that looks in a telescope. That’s the good news. The bad news is that like Saturn, it’s in the southern hemisphere and not only that, it’s 4° south of the ecliptic. The bottom line is that Mars only climbs to an altitude of 10° so will suffer from bad seeing. If you happen to be going to the Atacama, Rio, Pretoria or Alice Springs, find a local observatory, and Mars will be at magnitude -2.8 and dead overhead at midnight! 1924 1st contact (with umbra) Moon is below horizon and sun has not yet set. 2030 2nd contact. Moon now completely in umbra. 2108 Moon clears horizon And the sun sets, but it’s still daylight. 2122 Mid eclipse Only quarter of an hour after sunset. 2157 End of civil twilight Eclipsed Moon may be seen if sky very clear. 2213 3rd contact. Moon begins to leave umbra. Sky has been slowly darkening for the last hour. Moon will definitely be seen as it emerges from Earth’s shadow. 2303 End of nautical twilight. At last, the background sky is dark. 2319 4th contact, Moon leaves umbra. Doubtless the media will go mad in the days leading up to this event and describe it as the “Blood Moon eclipse of the century”, but fail to point out that we will not see the deepest part of the eclipse against a dark sky. You can see from the table that the time the Moon is in the deepest shadow (mid eclipse) is only quarter of an hour after sunset. The sky will still be bright and the Moon will hardly be 2 degrees above the horizon (roughly in the SE at azimuth 127°). 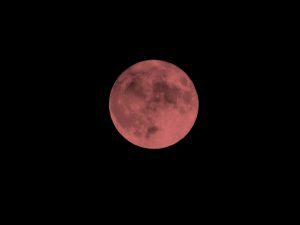 I may be wrong but I’m predicting it will be very difficult to spot such a deeply-eclipsed “blood red” moon at that time against a relatively bright sky. We’ll see it later of course, but by then the Moon will have moved towards the edge of the umbra. It will be interesting to see when the eclipsed Moon first becomes visible. For certain, a deeply coloured Moon will be seen from 3rd contact onwards. At 3rd contact (2213) it will be almost due SE at an altitude of 7°. This low altitude should give photographers ample opportunity to shoot the partially eclipsed Moon behind various terrestrial foreground objects. By 4th contact at 2319, the Moon will be at an azimuth of 152° and an altitude of just over 12°. A final thought: from about 2230, it may be possible to see Mars about 5° below and 3° to the right of the Moon. Could make for an interesting shot.